For those who are loving the concept of grilling food in their backyard or who are just into grilled food, choosing the most suitable grill is a must. The right grill will cook your food deliciously and should be very user friendly. In today Weber Q1200 vs Q1000 article, we are going to give you information regarding what you can expect from these two portable grills. If you are looking for a small grill to be easily carried everywhere or just a compact stay at home grill, go check our article below. Some people may able to purchase and use full sized grill for they have a wide backyard or don’t have limited space to store them when not in use, but there are also some people that can have the same luxury and just want a more compact version of grill that can be stored and use easily in their limited space. One of the best portable grill you can get your hand in the market now is the Weber Q1200. Coming from Weber, you shouldn’t worry about this grill quality. 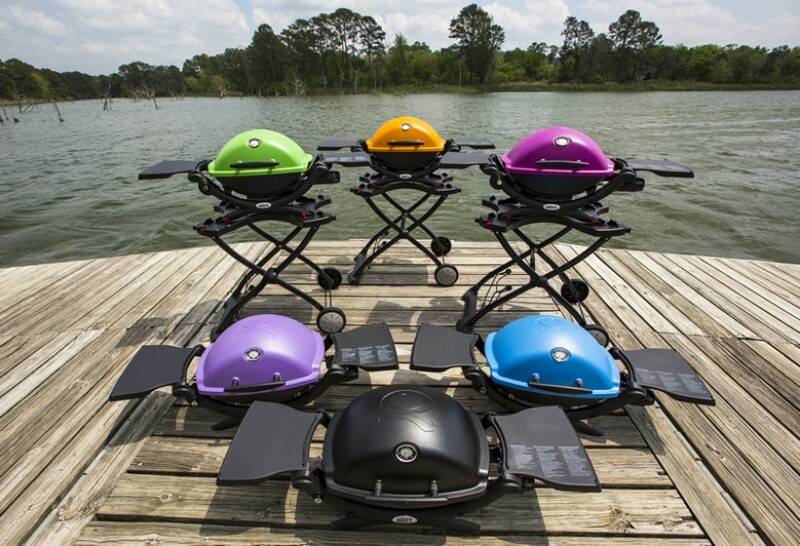 From the outside, the Weber Q1200 look just like many similar portable grills from the brand. It comes in a half circle shape with a big curved lid. The items measures at 20.5 x 40.9 x 24.6 inches and weigh around 29.5 pounds. All the parts in this grill can be separated and reassembly. It’s used electric ignition with AA battery and is quite heavy for the size to make it more robust. The Weber Q1200 works with propane gas, so you don’t have to deal with the annoying part of using charcoal like preparing and cleaning the mess. Gas grill is very suitable for those who want to get a fast result and power, not only it is easier to use and faster to ignite than charcoal, the heat can be adjusted, so it will be easier to use even for those with lesser experience. The company said that it can deliver heat at 8500 BTU, so your food will be cooked faster. As you can see on the picture there are two side work tables that can be folded. This additional feature is very useful since you don’t have to use additional table anymore near your grill and you can just place and prepare your raw ingredients right beside the grill for more convenient operation. What’s more convenient is the ignite method because Weber comes with electronic ignition that will only need one push to start cooking. Weber Q1200 are built with an excellent construction with a cast aluminum body that can holds in heat as well as heavy porcelain coated cast iron cooking grate to effectively transfer the heat from the burner to your food during cooking process. It has 189 square inches cooking space, which should be large enough to cook several steaks at once, so you don’t have to repeat the cooking process and save more time. It also has a thermometer on the lid to help you stay informed about your food. Another good grill that you can reach out if you think the price for Q1200 is too high is its more affordable model, the Q1000. Both of them actually based on the older model Q120 and Q100 but then improved to these models we know now. They are very similar to each other, but since it is cheaper, there will be some features stripped off to be more cost effective. If you are looking for similarly dependable grill, this one might be suitable for you. 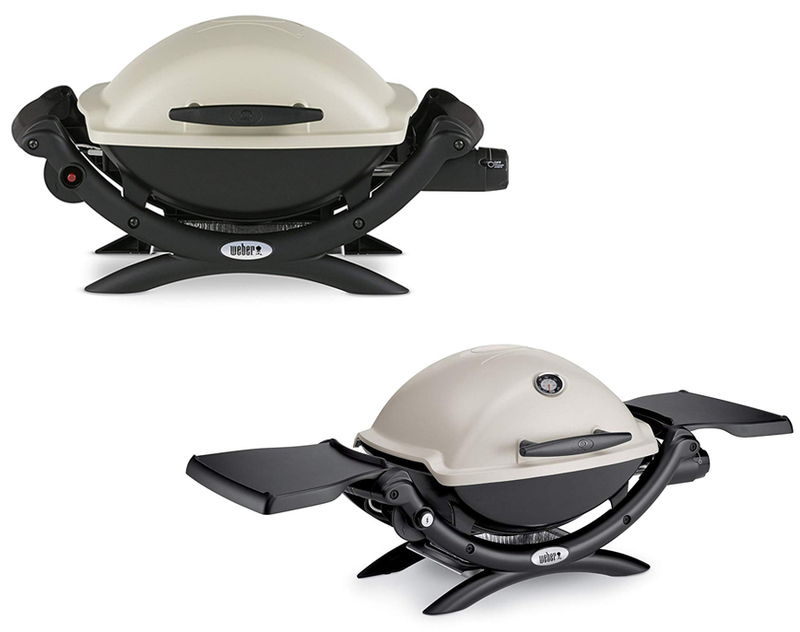 The Weber Q1000 still come with the same design like Q1200 but now the grill doesn’t have a side table that can be fold, so you can expect it to be lighter. It measures at 20.5 x 27 x 23.5 inches and weigh around 26.6 pounds. The main part look and feels very robust as well as heavy even though the cradle are made from plastic. It also still use the electric ignition system to add into the user convenience. As you may expect, this one is also powered with liquid propane gas, so you don’t have to deal with preparing charcoal and deal with the mess after as well as won’t need to refill the charcoal while cooking. Similar like those larger or full size gas grill that more look like a cooktop with heat adjustment knobs, this grill also comes with burner control knob to adjust the heat, so you can manage how the food is cooked. Read also: Weber Q1000 vs Go Anywhere here. When looking for a grill, you may also want to know how wide the cooking surface is because if it is not wide enough you will spend more time in cooking your food that need to be done in repeat. 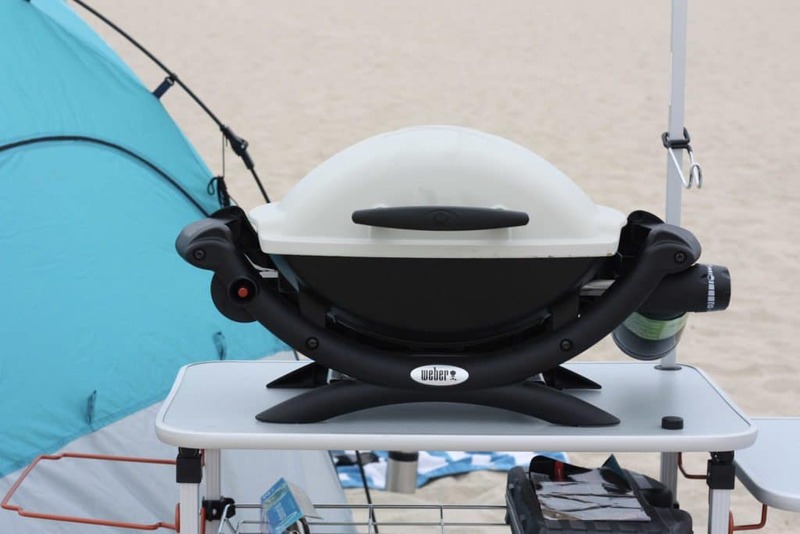 The Weber Q1000 grill surface in 189 square inch, which is big enough to grill several burger or regular steak and can be used to grill both meat and vegetable at once if you manage it carefully. The grill grate is made from porcelain coated cast iron like in most Weber grills. This material is well known in retaining heat very well while the porcelain coating make it easier for you to clean the surface. The company claimed it can deliver 8500 BTU per hour to heat the overall cooking area. Unlike the more expensive Q1200 grill, this one did have the same lid but without the thermometer to monitor the heat. Now, let’s compare Weber Q1200 with Q1000. As it has been mentioned earlier, both of these grills are very similar to each other whether from the design or material used. The things that separate them is only the additional features since Q1200 comes with two folding side table as well as thermometer on the top lid which are not present in the more affordable model Q1000. All in all, the decision is all yours to make. In our opinion, both of them are equally great and you can’t get wrong with either of them. However, when taking the price into consideration, we will recommend you the cheaper Q1000, so you can use the remaining money to purchase additional accessories.